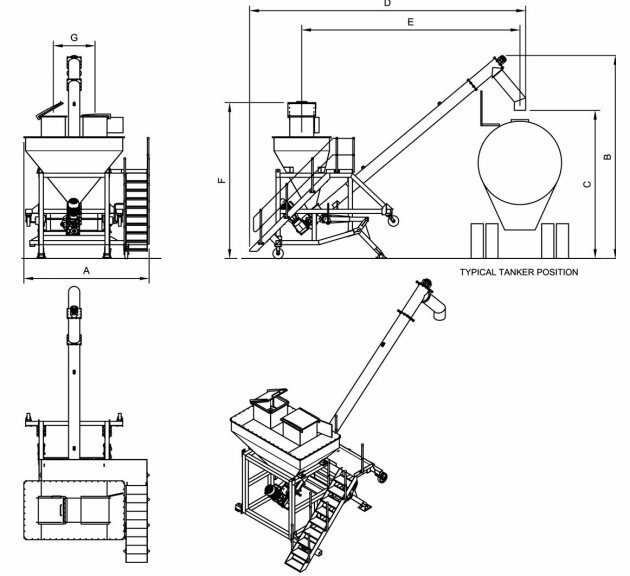 Bulkmatic Bulk Tanker Loaders are designed to assist in unloading bulk bags into standard height bulk tankers. 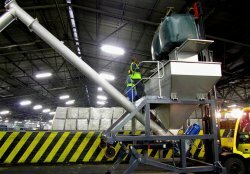 Very often imported chemicals, flocculants and other granular and powdered materials are imported in bulk bags. These are then transported from the harbours in bulk bags to minimize transport costs to the point of distribution. Here the products often need to be loaded into bulk tankers for final delivery to the customer. The bulk tanker loader takes care of this reloading operation. 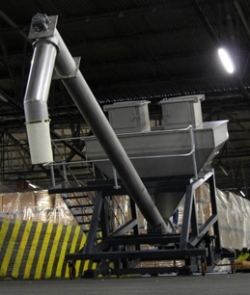 Two bulk bag hatches allow the operator to increase the loading speed by unloading two bulk bags at the same time. An incline screw then elevates the product to the inlet hatch of a bulk tanker. The unit is also mobile and can be moved to a desired position as required. While standing on all four wheels the unit has a total height of 4240mm. The complete unit is then tilted upward which fixes its standing position and elevates the screw outlet to clear a standard bulk tanker at 4250mm with a total unit height of 5840mm. The operator accesses the bulk spout opening hatches by standing on a platform that is reached via a stairway attached to the bulk tanker loader. Bag opening is safely accessible below the bulk bag resting tray. As an option an integrated reverse jet pulse filter can be fitted but requires separate access to compressed air. Units can be manufactured in mild steel or stainless steel depending on the product to be conveyed.